Jan and Tiina with one of the black nightsahde plants in the Really Wild Veg trial for 2016. Try to imagine how would you feel if you were invited to attend a meal where dishes made with black nightshade were going to be the centrepiece? This is exactly the position I was in recently at an Edible Gardening Project volunteer social. Although on the face of it this sounds really alarming, and one might reasonably wonder if someone had it in for you, this event was actually a great pleasure and really very interesting. 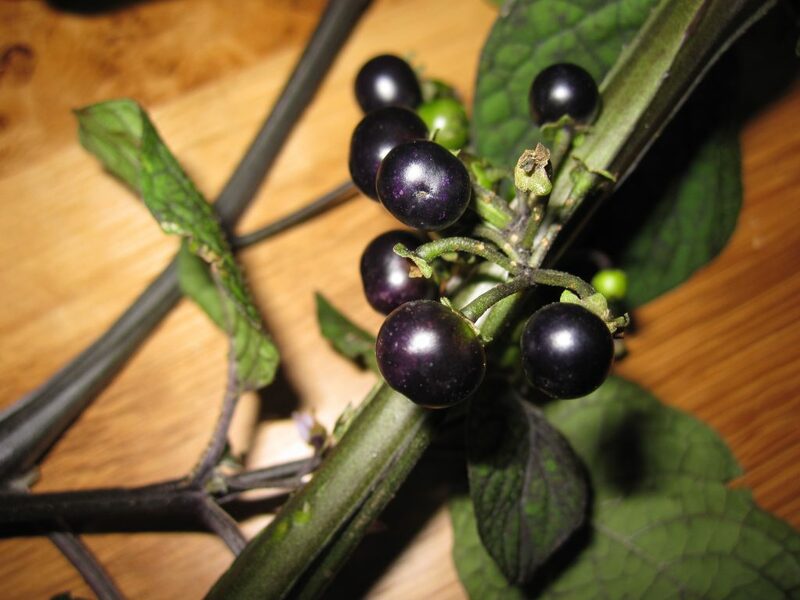 Black nightshade (Solanum nigrum) is a weedy plant that produces small black berries and lots of leafy greens. However, this pretty non-descript looking plant has some truely deadly cousins. The nightshade family, often called the potato family, includes the highly poisonous deadly nightshade (the names tells you all you need to know) as well as many other plants you’d be wise to avoid like the plague. The family is well known for producing toxins called alkaloids. The thing about green potato that is bad for you is the alkaloids. Obviously black nightshade is edible as serving toxic food to volunteers is a fast track way to get fired! Black nightshade fruit. In this species the fruit are not edible and the leaf is the crop, but in most of the other close relatives the fruit is good to eat. I should explain that black nightshade growing trials and tastings are the latest result of the Garden’s ongoing exploration of edible wild plants under the banner of Really Wild Veg. During 2016 the first set of trials have taken place and a lot of learning has resulted. Jan Tapson from the Edible Gardening Project volunteer team has taken the growing trials under her wing. 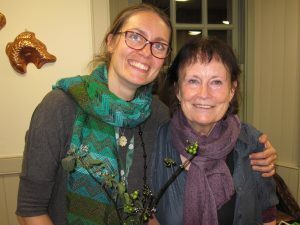 Seeds were obtained via Tiina Sarkinen of the RBGE science team as part of her research into the group of related species that are called the black nightshade group. A number of these are important tradditional crops in Africa, hence their other name African nightshades. The real interest in these plants, from a food plant perspective, is that research is showing they are highly nutritious and often better than the imported European crops that African farmers have been encouraged to grow. What we want to know is do they have potential as crops in Scotland, which is why the trials are so important. The other advantage of growing them is that they link directly to current botanical research being carried out here to determine exactly how many species there may be in this group and what factors have driven their evolution. With a meal like this there is always that thought in the back of your mind that you might be about to poison yourself. For me that was intensified by the fact that I had moments earlier been helping Tiina to harvest the leaves and berries to be cooked up. I was given the task of picking berries from different types and keeping them seperate for later tasting. Naturally I sampled as I picked. All was going fine until I got an unpleasant buring sensation in my throat. I told Tiina about this and she casually said “oh no you should’nt eat the fruit of those ones there”! All I could do was assume that as she was not reaching for her phone to dial the emergency services I was probably going to live to tell the tale. 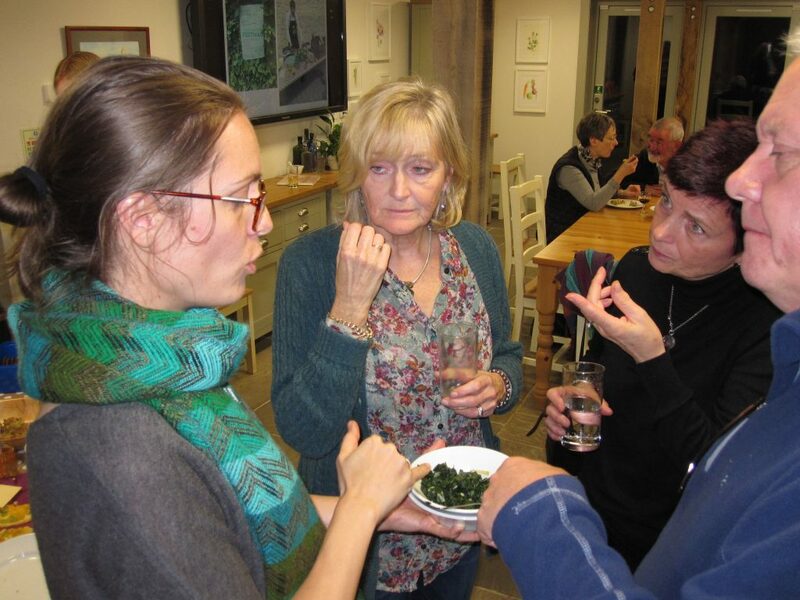 The story does have a happy ending as many of the Edible Gardening Project volunteers did get to try both the fruits (the edible ones) anf the cooked leaves as part of a most impressive spread provided in the form of a pot luck dinner in The Botanic Cottage. The leaves were parboiled with some bicarbonate of soda before being squeezed and either added to a dal or fried with onions and spices. The pretreatment step is supposed to reduce the bitterness of the leaves. In both forms they were truely delicious, with no obvious bitterness. Rather like spinach, but with much more substance to them. The berries, I have to say, are pretty bland, although Tiina has assured me that they do make a passable jam. Edible Gardening Project volunteers sampling black nightshade. This was certainly my most memorable dinner in a long time.